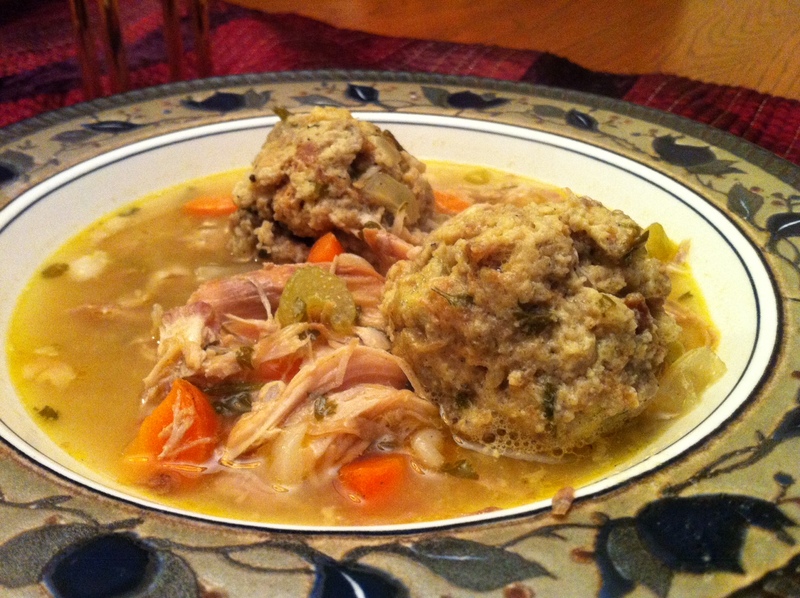 We left our Thanksgiving get together with the turkey carcass and transformed it into a comforting turkey soup with stuffing dumplings. The recipe for the dumplings calls for leftover stuffing, but we made ours fresh from a box of Stove Top stuffing. After a string of warm days, the chilly rain has come and this was the perfect meal to combat the cold. Yummy! Place carcass, celery, carrots, onions, garlic, parsley, salt, pepper and broth in an extra large soup pot over medium heat. Bring to boil, reduce heat, and simmer for 3 hours. Skim foam off soup as it cooks. After 3 hours, remove carcass, cool and shred meat. Return meat to soup. Simmer 40 minutes. Add remaining dill and serve. This soup freezes well. Combine the stuffing, eggs, sage, Parmesan and garlic in a mixing bowl. Using a heaping tablespoon, scoop spoonfuls of the mixture into the warm soup and cook for 10 minutes over low heat.